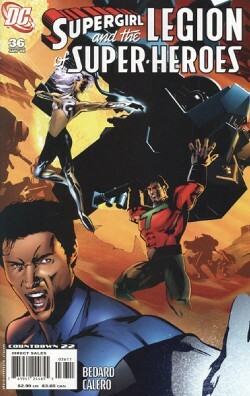 "The Quest for Cosmic Boy - Epilogue"
Saturn Girl, Supergirl and Lightning Lad battle Evolvo-lad to a standstill and find a portal inside his base. Supergirl looks through and finds it leads back to 21st century earth, and was built with the help of Brainiac 5. Brainy never believed Cosmic Boy was there, only sent Supergirl and her team there in the hopes of tricking her into going back home to her own time, where she belongs. Kara doesn't want to leave yet, without saying goodbye to the others, but the portal will not remain open for long and if she is to return, she has to leave now. And so leave she does, leaving Lightning Lad as Legion leader and her memories of her time with the Legion are wiped as she goes through the portal because knowledge of future history is dangerous. Also, no one was ever really looking for Cosmic Boy because Dream Girl has been communicating with Brainy while he sleeps and told him that Cos would return just fine. The search teams were created merely to gain Tenzil Kem as an ally, to get Timber Wolf to release his feral side, and to get Supergirl back home. Story - 3: Well, after all this time, Kara finally makes it back home. And it was a bit of a letdown. I don't know what I was expecting... maybe something grandiose or epic or, at the very least, meaningful and full of character. What we got instead was "Brainy manipulated you, the Legion LEADER, into doing exactly what he wanted, and now it's time for you to go. Bye." That kind of rubs me the wrong way. I know matching wits with Brainiac 5 is a losing battle for everyone, but it still made Kara come off a little like a chump, I think, and the fact that she didn't even get a proper goodbye with all of her teammates is upsetting. As Kara is now back in her own time, she'll no longer be appearing in this title and so this fine website will no longer be reviewing it. So I'd just like to take a moment to thank all of you who've been reading these Legion reviews; hopefully you've found them helpful or at least entertaining. Kara may be leaving on a down note, but as far as I'm concerned this was the most consistently well-written book I've read by all of DC in the time I've been reviewing it. It made a Legion fan out of me, which means it did its job. Art - 4: More of Calero's great work, although Brainy seems to have borrowed his hair from MC Hammer on a few panels on page 15, and the shot of Kara in the top panel on page 18, between the Legion and the Titans... I don't know what happened there, but her face looks like it got hit with some serious Joker venom. Very minor complaints, though, in what is otherwise very excellent art. Cover Art - 3: What's going on here? Dunno. Only one character here is actually even in this issue, and she's doing nothing remotely like anything she does in the issue, either literally or figuratively. And Cosmic Boy is on the cover even though he's been missing for this entire arc and no one has seen him anywhere. In other words, pretty much your standard confusing Legion cover.